If recovery is the key to success, then say “hello” to the locksmith. 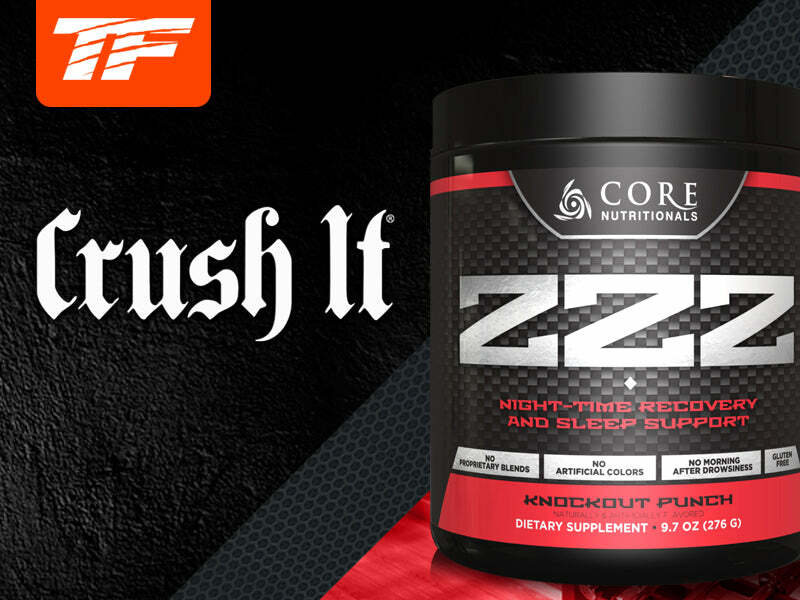 Core ZZZ is a perfectly-designed product with a single goal in mind: maximizing your recovery. We have included only the best and most effective recovery agents, at the proper serving sizes, to take the guesswork out of a good night’s rest. We have also specifically chosen these ingredients for the pathways they target, ensuring that every possible physiological pathway for recovery is covered. No more tossing nights and no more wasted workouts – put recovery at the top of your list by putting Core ZZZ at the center of your supplement lineup. MIX 1 SCOOP WITH 6-8 OUNCES OF WATER AND CONSUME APPROXIMATELY 15-30 MINUTES BEFORE BED. BEST TAKEN ON AN EMPTY STOMACH. DO NOT USE MORE THAN 5 DAYS PER WEEK. THIS PRODUCT IS ONLY INTENDED FOR USE IN HEALTHY ADULTS 18 YEARS OF AGE OR OLDER. PREGNANT OR NURSING WOMEN SHOULD NOT USE THIS PRODUCT. CONSULT YOUR HEALTHCARE PROVIDER BEFORE USING THIS PRODUCT, ESPECIALLY IF YOU ARE TAKING ANY PRESCRIPTION, OVER THE COUNTER MEDICATION, DIETARY SUPPLEMENT PRODUCT OR IF YOU HAVE ANY PRE-EXISTING MEDICAL CONDITION INCLUDING BUT NOT LIMITED TO: AN AUTO0IMMUNE CONDITION, A DEPRESSIVE DISORDER, A SLEEP CONDITION, HIGH OR LOW BLOOD PRESSURE OR OTHER CNS DEPRESSANTS, CORTICOSTEROIDS, IMMUNOSUPPRESSANTS, ANTI-COAGULANTS OR MEDICATIONS TO TREAT DIABETES OR HIGH OR LOW BLOOD PRESSURE. DO NOT TAKE THIS PRODUCT IN COMBINATION WITH ALCOHOLIC BEVERAGES. THIS PRODUCT CONTAINS INGREDIENTS THAT MAY CAUSE DROWSINESS. DO NOT OPERATE A VEHICLE OR HEAVY MACHINERY FOLLOWING CONSUMPTION OF THIS PRODUCT. IMMEDIATELY DISCONTINUE USE AND CONTACT A MEDICAL DOCTOR IF YOU EXPERIENCE ANY ADVERSE REACTION TO THIS PRODUCT. DO NOT USE IF SAFETY SEAL IS BROKEN OR MISSING. STORE IN A COOL DRY PLACE. KEEP OUT OF REACH OF CHILDREN.